Phaujdar S, Sharma V, Mishra R. A Patient with Left Cardiophrenic Angle Mass Presenting with Intermittent Chest Symptoms. Oman Med J 2013 Nov; 28(6):457-458. 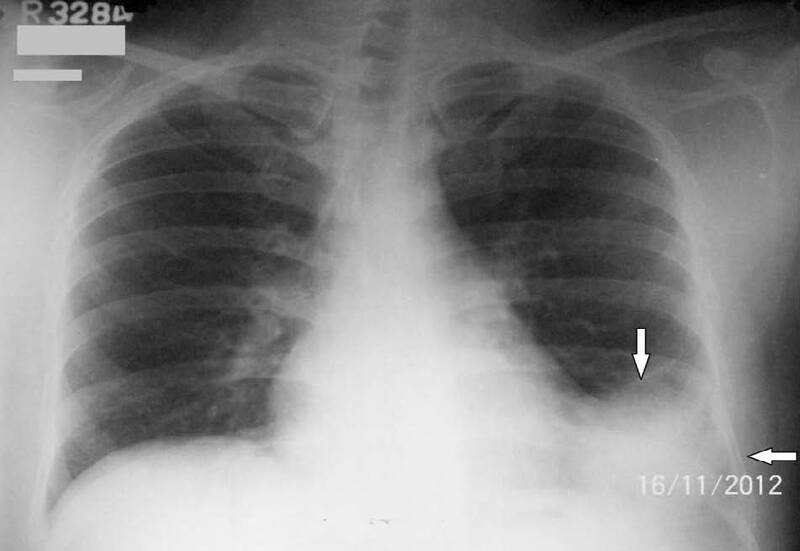 Figure 1: Chest X-ray PA view showing a lobular opacity at the left cardio-phrenic angle large enough to obscure the left costo-phrenic angle, shown by the arrow. Routine blood investigations and 12-lead electrocardiography (ECG) revealed no abnormality. Two-dimensional echocardiography revealed a large well defined mass having echo-free space measuring 9.0 × 5.6 cm, resting on the postero-lateral side of the left ventricle (LV) without any connection to ventricular cavity (Fig. 2). But due to poor window, the exact morphological and anatomical nature of the mass could not be substantiated. Later contrast enhanced computed tomography (CECT) scan of the chest confirmed (Fig. 3), a large well circumscribed cystic lesion measuring 9.8 cm (antero-posterior) × 6.4 cm (supero-inferior) × 5.5 cm (transverse) in the left lower hemi-thorax, abutting the lateral aspect of the pericardial cavity, not separable from it and indenting the lateral wall of the LV. It had thin barely perceptible wall, homogeneous fluid attenuation content, without any foci of calcification, contrast enhancement, or internal septa. 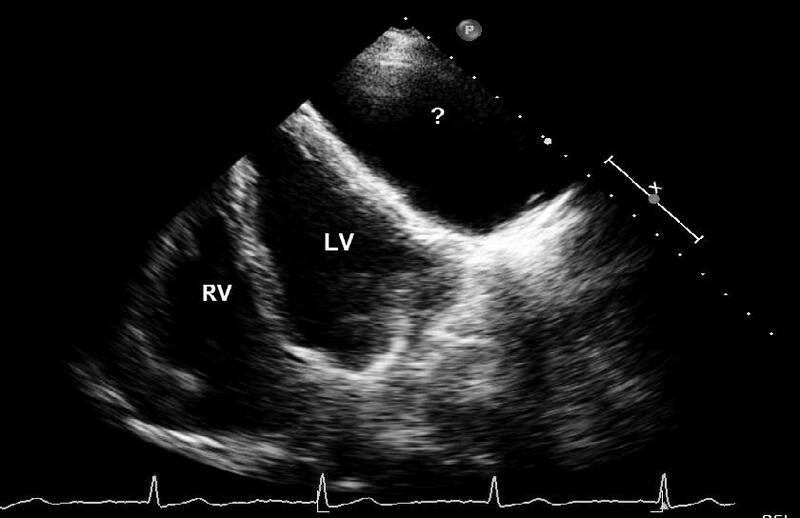 Figure 2: 2-D echocardiography showed a large well defined mass having echo-free space near the postero-lateral side of left ventricle (shown by interrogation mark). Figure 3: CECT chest showing a large well circumscribed cystic lesion in left lower hemi-thorax, abutting lateral aspect of pericardial cavity. All imaging studies suggested a large congenital benign pericardial cyst arising from the left cardiac border. 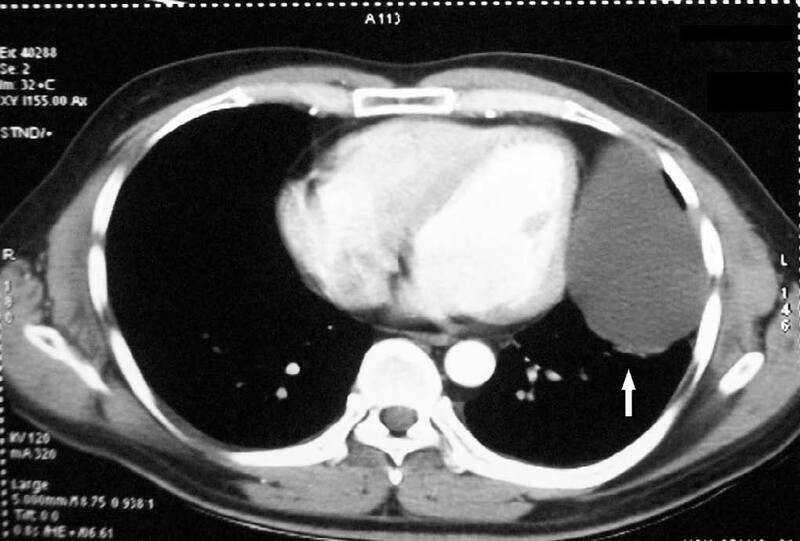 In view of this large pericardial cyst causing local compressive symptoms, cardio-vascular surgical opinion was taken and they suggested for surgical excision of the cyst. Surgical procedure was uneventful with postero-lateral thoracotomy in the 6th intercostal space and complete excision of the cyst measuring 9 cm × 7 cm × 5 cm, containing clear straw-coloured fluid inside. Biochemical analysis of the fluid favoured transudative nature according to Light’s criteria (cystic fluid protein was 2.8 g/dL, Lactate dehydrogenase (LDH) was 110 U/L; whereas serum protein was 6.4 g/dL and serum LDH was 190 U/L). Cell count of the fluid was 180/cu.mm with 90% lymphocyte and 10% neutrophil. Histopathological evaluation of the cyst showed the wall formed by only a single layer of cuboidal epithelial cells over a basement membrane formed by loose stroma and collagen fibers. The patient recovered favorably in post-operative period without any resurgence of compressive symptoms or cough. Though it follows a benign course throughout, it may in rare instances become symptomatic when it grows very large in size or when the wall is secondarily infected. Symptomatic patients generally present with progressive cough, chest pain (retro-sternal or at cardiac apex), dyspnea, palpitation, early satiety or dysphagia; but sometimes medical emergencies may arise for example: cyst rupture producing cardiac tamponade, cyst wall infection with erosion of large vessels and obstruction of larger airways causing sudden death.1,4 In the present case, local compression of the airways and other local mediastinal structures caused intermittent cough and occasional chest compressive symptoms. Pankaj Kaul et al. reported a case of a large pericardial cyst producing local compressive effects, finally resulting in superior vena cava obstruction and right middle lobe atelectasis by obstructing the right main bronchus.6 Other rarer complications such as right ventricular outflow tract obstruction, atrial fibrillation, pulmonary stenosis and congestive heart failure have also been reported.1,4,5 As in our case, the cyst originated from the left cardio-phrenic angle which is not very common. The wall of the cyst showed only single layer of cuboidal epithelium in histopathological evaluation, ruling out possibilities of any recent infection or inflammation. In conclusion, congenital pericardial cyst is a rare entity to produce mediastinal compressive symptoms. MRI or at least conventional CT scan is a better modality to demonstrate the origin of such cysts. We express our sincere thanks to Senior Consultant Cardio-vascular surgeon Dr. Om Parkash Yadava for his contributions in final work up of the case. 1. Maisch B, Seferović PM, Ristić AD, Erbel R, Rienmüller R, Adler Y, et al; Task Force on the Diagnosis and Management of Pricardial Diseases of the European Society of Cardiology. Guidelines on the diagnosis and management of pericardial diseases executive summary; The Task force on the diagnosis and management of pericardial diseases of the European society of cardiology. Eur Heart J 2004 Apr;25(7):587-610. 2. Lambert AV. Etiology of thin walled thoracic cysts. J Thorac Surg 1940;10:1-7. 3. Lillie WI, McDONALD JR, Clagett OT. Pericardial celomic cysts and pericardial diverticula; a concept of etiology and report of cases. J Thorac Surg 1950 Sep;20(3):494-504. 4. Patel J, Park C, Michaels J, Rosen S, Kort S. Pericardial cyst: case reports and a literature review. Echocardiography 2004 Apr;21(3):269-272. 5. McAllister HA Jr, Buja LM, Ferrans VJ. Pericardial disease. Anatomic abnormalities. In: Willerson JT, Cohn JN, Wellens HJJ, Holmes DR eds. Cardiovascular Medicine. 3rd Ed. Springer-Verlag, London 2007; 1479-82. 6. Kaul P, Javangula K, Farook SA. Massive benign pericardial cyst presenting with simultaneous superior vena cava and middle lobe syndromes. J Cardiothorac Surg 2008;3:32. 7. De Roover P, Maisin J, Lacquet A. Congenital pleuropericardial cysts. Thorax 1963 Jun;18:146-150. 8. Roy M, Bandyopadhyay R, Pandit N, Sengupta S. Superior Vena Cava Syndrome: A Presenting Feature of Mediastinal Germ Cell Tumor. Oman Med J 2010;25:131-133 . 9. Duwe BV, Sterman DH, Musani AI. Tumors of the mediastinum. Chest 2005 Oct;128(4):2893-2909.